Contrary to what one might think, the acidic PH of white vinegar helps to rebalance the pH of damaged skin and to reduce the sensation of heating. Mix in a bowl the same quantity of white vinegar and water, and soak the compresses in this mixture. Let rest for five minutes. If your burn is extensive, perhaps it would be more useful to take a warm bath and dissolve 25 cl of apple cider vinegar. Stay 20 minutes then rinse thoroughly with warm water, not hot. The above procedure should give you a quick relieve. Often used in pastry (for those who cook), baking soda is one of the most effective natural home remedies against burned skinned. It also has antiseptic virtues and when mixed with fresh water it is super active. For quick and effective relief, apply and let sit for ten minutes. We all have potatoes in our kitchen, and it turns out that they are a swift way to relieve a sunburn! The method is rather simple: cut your potatoes in bits and rub them on the burned skin parts until the starch is dry. Repeat this procedure until you feel relieved from the hot and burning sensation. Natural fresh tomatoes contains a powerful antioxidant: lycopene (vitamin A) which helps rebuild the skin. 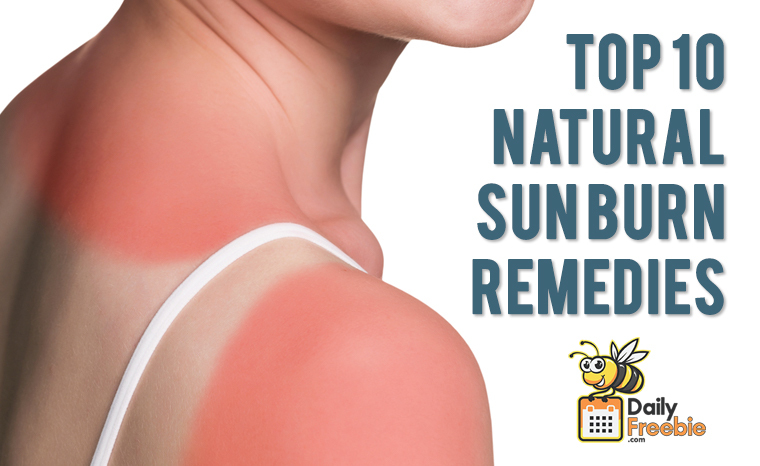 When you get sunburned, there is significant destruction of lycopene in your skin. Thus, the lycopene contained in the tomato will act primarily on the skin in synergy with other antioxidants such as vitamin E and help rebuild the skin while removing the effect of the burn. It also prevents the skin from peeling or blistering. For this, cut a tomato into slices and apply them on the red parts of your skin for about 20 minutes. The feeling of fire and the pain should disappear very quickly. It may seem surprising, but yogurt helps heal lighter sunburned skin. Indeed, the lactic ferments contained in the cottage cheese, for example, have an anti-inflammatory effect, while the proteins would alleviate the pain. Natural Yogurt or Cottage Cheese is a miracle product against sunburned skin. Apply a good layer of yogurt (or cottage cheese) on the painful and affected parts and leave for 15 to 20 minutes before rinsing with cold water. The freshness of cucumber is highly recommended to soothe sunburn. So peel a cucumber freshly out of the fridge, pass it in the blender with a few drops of olive oil, pass through to the strainer and apply the lotion on your skin. This citrus also has a “magic” virtue of relieving your skin in case of sunburn. A practical and simple remedy for pain is an excellent little squeezed lemon juice straight out of the fridge. To apply to the burned area, it soothes and helps to cool the heated skin. You can also mix the juice of three lemons with 50cl of cold water and pass the preparation on the sunburns. Not only does it refresh, but it also disinfects and regenerates the skin. This plant contains an unusually high number of amino acids, which help the regeneration of the skin and thus confer quite exceptional healing qualities. To relieve your burns, collect and apply concentrated aloe vera gel to the area to be treated, and let it sit. If you do not have aloe vera plant, get a tube of gel, it will serve you in case of burns. Simply miraculous! Honey, on the other hand, has always been known for its beneficial properties. It is healing, antiseptic and can even soothe your skin reddened by the sun. Apply liquid honey directly to the burned areas and cover with a compress. Leave on for 15 to 20 minutes and rinse with cold water. In addition to relieving you, the honey will moisturize your skin, which may prevent it from peeling! It is already known that green tea, as an infusion, has great self-tanning powers. But this is not his only possible use. Indeed, our grandmothers recommend tea bags to relieve sunburn on the eyelids! When we fall asleep on the beach in the sun, it is not uncommon for the thin skin of our eyelids to be affected and it is very often recommended not to apply moisturizer on it, as this may irritate your eyes. So, brew two tea bags or herbal tea, immerse in a bowl of water full of ice to cool them and then apply them on your eyes until feeling a sense of calm. If you must have an essential oil in your bag during your outdoor getaways and in full sun, you should not to leave your lavender essential oil (lavender, lavender aspic lavender, etc.) that will relieve your burns. You do not have to buy it; you can prepare it yourself. To do this, mix 10 ml of vegetable oil of your choice with 10 ml of lavender essential oil, and voila! Avoid exposing yourself to the hottest hours of the day (between 12pm and 4pm). Protect yourself with light cotton clothing (T-shirt, shorts, hat, glasses, etc.) if you expose yourself during these hours. Apply a sunscreen with a sun protection factor adapted to your skin type. Hydrate yourself well all day by drinking at least 1.5 l of water. Note: these natural remedies are only valid for small burns. In case of severe sunburn, blisters or fever, nothing beats medical advice!